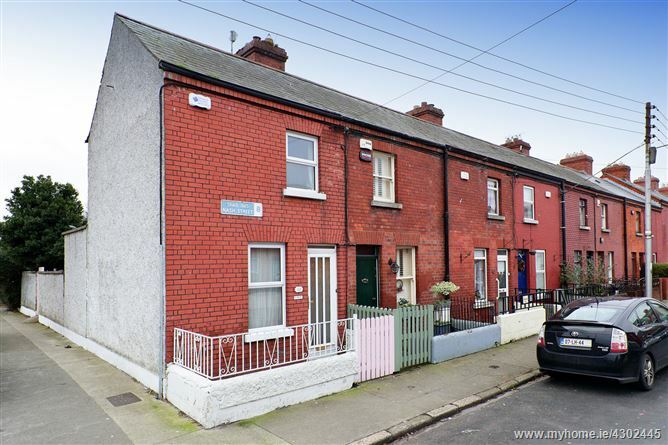 Charming Edwardian red brick two bed end of terrace home situated in Inchicore village. This end of terrace property, built c. 1910, boasts its original red brick façade and is fronted by a courtyard and low wall, topped with wrought ironwork railings. Upon entering, there is an entrance lobby with a glass panelled door leading into the living room. The living room is a warm and inviting space, illuminated through a large window, featuring high quality engineered wood flooring and the original brickwork fireplace and wood burning stove. The adjacent kitchen/diner is spacious and modern with solid wood counters and cabinets, in built appliances and splashback tiling. The bathroom is lit through an opaque window and has a fully tiled floor and back-tiled full-size bath/shower as well as modern fixtures, an efficient and easy to maintain space. Upstairs lie the bedrooms. The Master bedroom is a bright and airy room blending practicality with minimalist design, with a large in-built wardrobe and well-lit through a window overlooking the garden. The second bedroom is light-filled with free standing wardrobes, high quality engineered wood flooring and a large double-glazed window. The garden has an ideal South-facing aspect, accessible via kitchen, featuring a slabbed patio and path leading past two lawn beds to a raised shed and bordered by a tall wooden fence. The garden is also benefitted by a private side access gate. 10 Nash Street is situated in a historic neighbourhood within Inchicore village. There are a number of shops and services in the area, including a Tesco’s, local Post Office and several pubs and restaurants to choose from. Local amenities include the Jim Mitchell Park & Playground, the Grand Canal walk/cycle ways and the Phoenix Park only 10 minutes away. The city centre is only 10/15 minutes by car and public transport is available through a series of central bus routes and the Red Line LUAS, accessible via the Blackhorse LUAS stop.